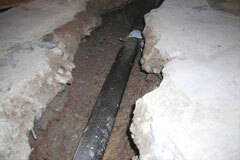 A slab leak is a rupture to a pipe line located beneath concrete or underground. Beneath slab foundations are soft copper line. Sometimes these soft copper lines become bent, kinked or dented. Sonar is an acronym for Sound, Navigation and Ranging. We are equipped with sonar leak detectors that will find and locate slab leaks underground in clean waterlines, sewer lines or gas lines. Our tracing and listening devices allow us to test, locate and repair all leaks under the slabs of your personal or commercial property. We can accurately locate the source of the smallest leaks. Not sure if you have a slab leak? Give us a call and we will use our electronic sonar detector to determine if there is a leak. Additionally, we strongly recommend testing for slab leaks before purchasing or selling a personal home or commercial property. • Shifting or damage of the foundation may cause pipes to move and start to leak. • Water Chemistry – city water chemical composites affect the pipes. • Water flow rate – heavy pressure and high water speeds may cause pipe erosion which may lead to leaks. • Initial incorrect installations – including bad connections or poor soldering. • Caustic elements placed down drains (chemicals, acids, cleaning solutions, etc.). • Initial incorrect installations, including bad connections or poor soldering. • Rust – When piping is left in soil that is constantly wet, dissolved minerals such as sulfate and chloride along with large quantities of organic material will act upon the cast iron or galvanized pipe causing breakdown and failure. PVC can be immersed with no effect.